Matthias Wurz is currently a PhD candidate in Musicology at Bangor University and as such recipient of the prestigious Parry Williams Scholarship. Matthias is currently working on interdisciplinary and performative aspects of Arnold Schoenberg’s Pierrot lunaire. He has given an extended workshop performance at the Bangor Music Festival 2017, together with the chamber choir Cantamus. Prior to his arrival in Bangor, he studied Music at University of York (B.A. hons) and completed his Masters in Historical Musicology at the Royal Holloway. As a conductor, Matthias has been newly appointed as Music Director of Cantorion Rhos in Wrexham. He is also Music Director of the Isle of Anglesey Choral Society and Director of Music at St Mary’s Church in Mold. From 2014 to 2016, he was the Music Director of the renowned male choir, Cor y Traeth, based on the Isle of Anglesey. Under his directorship, the choir appeared in Penelope Keith’s series ‘At Her Majesty’s Service’ (Channel 4, June 2016). In May 2016, Cor y Traeth appeared at the Beaumaris Festival. 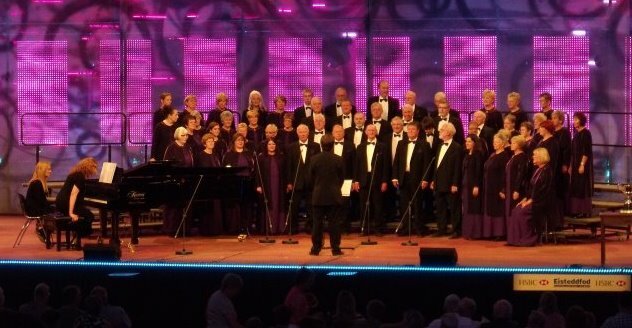 The choir also came third in the Eisteddfod Môn (May 2015). Having foremost trained as an orchestral conductor and enjoyed engagements throughout Europe, Matthias also works regularly with Bangor University Symphony Orchestra. Matthias was among the first graduates of the pioneer choral conducting course of the Association of British Choral Directors (1999-2000), where he studied with Peter Broadbent, among others. A former member of the Vienna Boys Choir (1985–1989), he has retained his passion for singing while pursuing a career as conductor and musicologist. Recent performances as a singer include appearances with his choirs, notably with Isle of Anglesey Choral Society and Cor y Traeth. In 2015, he also performed behalf of the Oxbridge Singers at the Stepping Stone Festival (Carlisle). Message for Matthias from Australian Barbara Peters whom he met in 2001 at Vienna Opera and told me about historical records at the Austrian Archives & his Georg Tintner research.